All DS owners willove reading this book, about and author ourdoors man and the adventures so a dog he adopted on a float trip, their adventures together, though hunting, women, the community.. a truely great book about a great relationship with a dog. 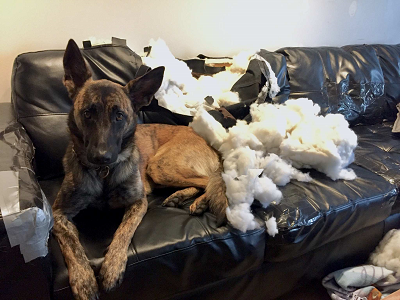 Im sure all of you being Dutch Shepard owners can relate. oohh Ill have to get it!! I love this book. But a little warning, your husbands (or s/o) and family and friends will probably get annoyed of hearing all of the facts and interesting dog related careers available that are mentioned throughout the stories. I first got this book when I started dating my (now) husband. Our first date was a bet on whether or not he'd stop making fun of me for talking about dogs so much. Never-less, thanks to this book, I had enough random facts to annoy him into losing. whaaaaa!! my vet read that book and told me I would love it!! Have to get it now. LyonsFamily wrote: I first got this book when I started dating my (now) husband. Our first date was a bet on whether or not he'd stop making fun of me for talking about dogs so much. Never-less, thanks to this book, I had enough random facts to annoy him into losing. I just found a copy on my desk that someone had loaned/given me a few months ago. I need to make time to read it! Thank you for the reminder!